In 1849, a group of California bound emigrants were headed out of Utah with a 107 wagons led by Captain Jefferson Hunt. However, by November, the group disagreed on the most direct route to the goldfields. Some believed there was a much shorter route across the desert, rather than taking the well-known route along the Old Spanish Trail. Though Hunt warned them that they were “walking into the jaws of hell,” several members of the group parted near Enterprise, Utah, believing the shortcut would save them about 20 days of travel. They would become known as the “Lost ’49ers,” nearly starve on their journey, discover silver, and give the valley its name. The splinter group consisted of several smaller parties, who would also disagree on the best way to cross the vast desert. 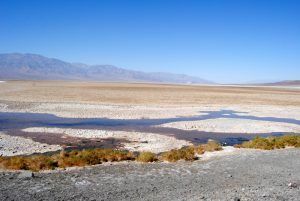 Before reaching White Sage Flat, the party split once again, with one group hiking over the Panamint Mountains and the other traveling along the floor of the valley. During the terrible journey, the pioneers had killed their oxen for meat, burned their wagons, and were forced to walk most of the way on what had become a “shortcut to hell.” In the meantime, the party who had stayed with Captain Hunt’s group had already arrived in California. After settling in Jim Martin, who had lost the sight off his rifle during the journey, took the silver ore to a gunsmith who made it into a new gun sight. The story quickly spread, touching off one of the West’s great prospecting booms and the legend of the Lost Gunsight Mine. One of the travelers, a Mr. Turner, who had been with Martin when he discovered the silver, decided to return to the desert in search of the silver. Failing to find it, he soon came upon a ranch belonging to Dr. E. Darwin French near Fort Tejon. Telling the doctor the tale, French and Turner mounted a second expedition to search for the silver outcropping in September 1850. They too were unsuccessful. Though the “Lost Gunsight Mine” was never found, dozens of other prospectors were successful in finding hidden wealth in Death Valley.